I started using nattokinase supplements because I have blood circulation problems caused by DVT (Deep Vein Thrombosis, or blood clot) which I suffered whilst I was in hospital over ten years ago. I categorically know the nattokinase enzyme works, because I have received great relief from its health benefits. I now swear by its powerful healing properties. The correlation between nattokinase and it’s ability to dissolve blood clots is proven. But there is still a lot of research that needs to be done and evidence proved for its effects on cancer, even though some people have talked about how nattokinase has helped to relieve their own cancer symptoms. But this notion of the nattokinase enzyme and how it affects the cancer cells or tumor is actually quite a profound theory, and one that someone with cancer may want to consider. Cancer is a disease that can strike at any part or organ of the body. It is often a fatal condition, but do you know how it develops within the body? This is important when we are considering the health benefits of the nattokinase enzyme. Each part of our body from our brain to our bones are made up of tiny cells. As we grow and age, or as our body repairs itself after (for example) a cut, these cells divide and multiply into new cells replacing and adding to the old ones. But when cancer is present, these cells continue to divide and multiply, even though the body does not require them. This results in the forming of a protein called fibrin around the benign tumor or malignant tumor. A benign tumor is one that is non-cancerous and has stopped growing, and one that can be shrunk by various means. A malignant tumor on the other hand, can be quite aggressive in the way that it grows and is often fatal to the patient. I’ve had first hand experience of a malignant brain tumor, because my father passed away in 2001 from this disease. It was a traumatic time for him before his passing, because the type of tumor he had was ‘star’ shaped and spread into his brain in many different ways. I wonder now if nattokinase could have given him a better and longer life! 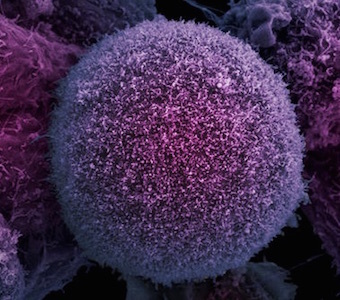 Cancer cells are starved of oxygen. This is called an anaerobic effect. This is where nattokinase can be of a huge help in attacking the tumor and shrinking it. It could also act as a deterrent for this disease, and could even halt the spread of cancer further around the body. How Could Nattokinase Help Cancer Patients? Nattokinase improves blood flow by thinning the blood. This means that oxygen and other nutrients are transported around the body more efficiently, and more oxygen is transported to the infected tissue and cells than it normally would be. If you read our article on fibroids in women, you will already understand how nattokinase helps to prevent fibrous blood clots from developing and how it also disperses fibrin (if you haven’t read it, we recommend that you read it because of the similarities). This affect shrinks the fibroids. So this proteolytic enzyme has two separate and potential benefits for cancer patients. Transports oxygen to the affected area, because of cancers oxygen starving effect. Prevent fibrous clots and dissolves the fibrin coating around tumors. Because cancer patients need to thin their blood to help break down fibrin, nattokinase could be taken for this purpose, thus adding to fight against the cancer cells. If you do want to use nattokinase, we recommend that you discuss it further with your doctor before adding it to your diet or nutrition plan. Another very powerful proteolytic enzyme, which has positive effects on cancer, is serrapeptase. It can be taken with nattokinase (as well as a few other ingredients), to great effect. Serrapeptase is a miracle enzyme for cancer patients, where some reports have revealed patients going into complete remission after treatment. Your doctor probably won’t tell you about the power of such enzymes, but it only takes a little research to see how powerful they can be. As we discussed earlier in the article, limited research exists on nattokinase, and its effects on cancer for it to be used as a sure way to ease cancer symptoms. But, if I had my time with my father over again, I would not hesitate to suggest the use of proteolytic and fibrinolytic enzymes to make his life a little easier. If you take Nattokinase, can you take Turmeric? Are there any bad effects when taking these two together? Hi Elizabeth, I don’t have anything in my research perse, but I believe you can take both with no side effects. In fact, I am thinking of taking both together myself starting next month.